Sophia Grace and Rosie, the little cousins from Essex, England who we were all so charmed by after their "Super Bass" cover in 2o11 and are now all >:\ about in 2014, have a five — count 'em: FIVE — picture deal with Warner Brothers. 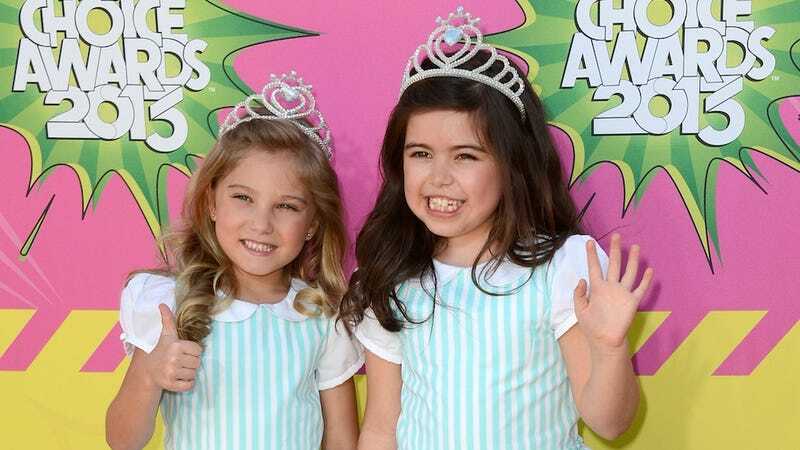 Of the five films, one — Sophia Grace & Rosie's Royal Adventure — has already been released straight to video. According to TMZ, Sophia Grace was paid $50K for the picture and she will earn tens of thousands more with each new installment: $75K for films two and three and $100K for four and five. Rosie's deal was not published, but I'm guessing her salary is made up of basking in the light of Sophia Grace and hearing "If it wasn't for me, you'd be nothing. NOTHING. I could get you sent to an orphanage if I wanted to. You know I could" from her cousin one to six times daily. *This post was ghostwritten by Drew Barrymore.